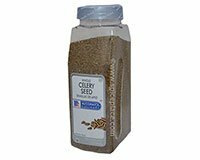 McCormick Celery Seed Celery Seed has a flavor and aroma similar to the celery vegetable. The Celery Seed flavor notes are characteristically hay-like and grassy. Celery Seed comes from the dried fruit of the herb Apium graveolens that is related but not the same as the vegetable celery plant. The tiny, brown Celery Seeds have a celery-like flavor and aroma. Celery Seed has a special affinity with tomatoes and is primarily used in salads, especially potato salad. Use Celery Seed in egg dishes, soups, sauces, meats, dips, vegetables, and stuffings.